At Meridian, he coached 30 players who signed to play Division I baseball and had 10 players selected in the major league draft, including 2008 American League Cy Young Award winner, Cliff Lee, then with Cleveland Indians, who played for Berry in 1999 and 2000. Lee is one of four current major leaguers who played under Berry including Baltimore Orioles pitcher Bob McCrory (Southern Miss), Los Angeles Dodgers pitcher Brent Leach (Southern Miss) and Houston Astros infielder Jason Smith (Meridian CC). Berry, a native of Neosho, Mo., played two seasons collegiately at Crowder College, where he was a two-time all-region selection and the team’s most valuable player his sophomore season. A back injury forced his career to come to an end prematurely, but Berry spent the final two season of his college career as a student assistant coach at Southwest Missouri State where he earned both his bachelors and masters degree. He and his wife Laura have two children, Garren (15) and Kathryn Grace (6). Laura received both her bachelor’s and master’s degrees from Southern Miss in speech communication. He is the son of Marliyn Berry and the late James Berry. HATTIESBURG - The Scott Berry Era of the Southern Miss baseball program will open with a No. 21 preseason ranking, release today by Collegiate Baseball Magazine in their annual top 40 preseason poll. Opponents on the Golden Eagles 2010 schedule can also be seen throughout the polls. The Golden Eagles hold the No. 21 national ranking and out performed despised, in-state rival, Ole Miss. Conference USA garnered a lot of respect. Conference foes Rice and East Carolina were ranked at 11 and 18 respectively, while UCF, Houston and Tulane were listed in the "also received votes" category. LSU is the only other team ranked in the top 40 on the Golden Eagles 2010 schedule with a No. 2 national ranking; however, Missouri State, Mississippi State and Troy all received votes. 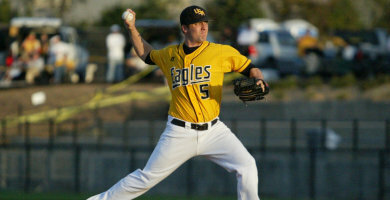 The Golden Eagles open the 2010 season on February 19 at Pete Taylor Park. The GoldenEagles.net netwrok is not affiliated with the University of Southern Mississippi. It was created and registered on the 10th of May 1999 for the personal enjoyment of Southern Miss fans everywhere.